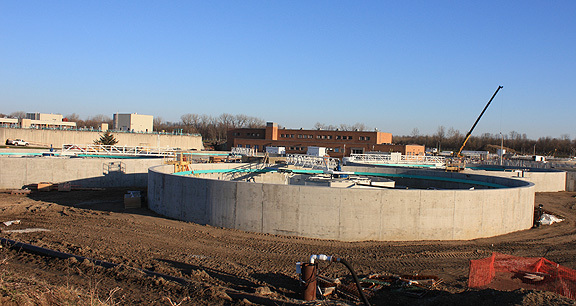 Project obstacles and solutions: Citizens Energy Group is updating its Southport Advanced Wastewater Treatment facility which processes the majority of the sewage for the City of Indianapolis. The major renovation includes rerouting the flow of wastewater throughout the facility to the opposite direction of its present orientation. Key to this was the construction of new clarifying tanks. Bowen Engineering is the general contractor for the renovation. IMI supplied a 4,500 psi mix for the new clarifier walls and floors that used a high range water reducer to increase the slump and a crystalline admixture to waterproof the concrete. The concrete required a waterproofing agent to keep water from seeping into the walls and breaking down the structural steel. The crystalline admixture was added during the batching process. It forms a bond with the concrete and fills all of the bleed water capillaries. During the curing process, the admixture reacts to the byproducts of cement hydration and forms impervious crystalline molecules throughout the concrete. This speeds up the construction process, as the walls do not have to be waterproofed with a sealing pitch after curing. The renovation of the Southport Wastewater Treatment Plant is scheduled to conclude by the end of 2017. When completed, the expanded plant will be able to process 360 million gallons of water daily, doubling its capacity. For more information on crystalline admixtures or other waterproofing methods, contact your IMI sales representative. Click here.